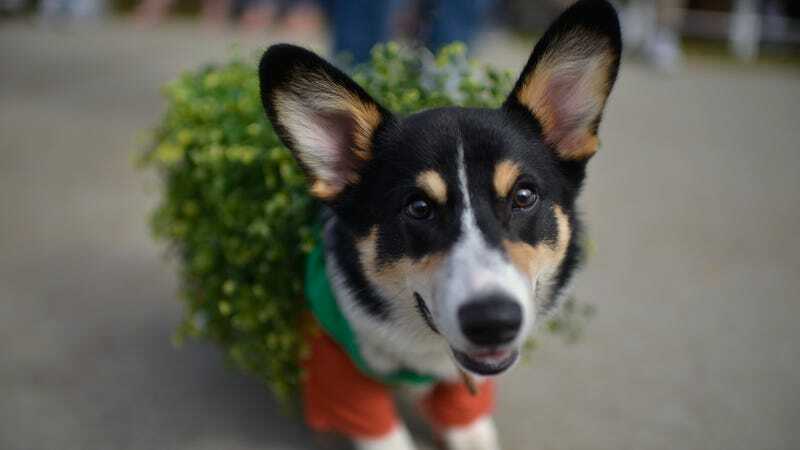 Wilson the corgi, dressed as a chia pet, at the Haute Dog Howl’oween Parade on October 29, 2017 in Long Beach, California. Dogs have been everything we’ve ever needed them to be, including volunteers for clinical trials of drugs meant for both people and pooches. Sadly, these furry test subjects are sometimes euthanized at the end of these experiments, because it’s deemed the only way to get the accurate test results scientists are looking for. But the Food and Drug Administration is set to start a small—and safe!—study of dogs that might change that way of thinking. One type of research that dogs are often euthanized for is the study of new antiparasitic drugs. Dogs are artificially infected with parasites, then given drugs to treat them. Because some of the molecules used in these drugs only affect the gut, and aren’t systemically absorbed by the body and bloodstream, it can be hard to confirm that the drug actually worked. So scientists will euthanize the dogs to physically examine their bodies for parasites. But the new planned study, according to a proposal released by the agency Friday, will see whether alternative methods of drug detection that simply rely on blood tests can gauge a drug’s bioequivalence as accurately as the more gruesome method. Because these drugs are so well-studied, we already know how they affect a dog’s body. Based on that data, the FDA’s scientists have created a model that basically uses the level of drug absorption in the blood from one drug (the widely absorbed one) to predict how the other drug (absorbed locally) is working. So it’s hoped this experiment will show that this model can be accurate in the real world, and how to better refine it if it needs to be. If successful, the FDA would then promote the model to be used by drug companies hoping to get approval for their generic drugs, greatly reducing the number of dogs that are both used in live trials and sadly euthanized. In recent years, as a part of a global movement to replace, reduce, and refine the use of animals in research, scientists have started to create their own computer modeling programs to take the place of animals, a method also known as “in silico” testing. Other have created less invasive diagnostic tests or even begun to rely on human-like organs in the lab that are lined onto microchips—methods that the FDA is reportedly using more often in its work. The FDA will allow the public and interested parties to offer comment and suggestions on their proposal for the next 60 days, after which the study will likely begin to get underway. As for the brave dogs that would be used in this study, the FDA says they’ll be retired from their lab duties permanently after the experiment, and be given for adoption as pets.